The Lutheran View of Law and Gospel is not an Old-New Testament dividing line | J.W. Wartick -"Always Have a Reason"
I’m going to admit a huge pet peeve of mine here: non-Lutherans misunderstanding the Lutheran view of Law and Gospel. I have found this demonstrated more than once in the Zondervan Counterpoints series. Now, I don’t want to take anything away from that series. My wife can attest that I love it. I have over 15 volumes of the series. But I have to wonder why it seems they rarely get Lutherans involved and, frankly, why they would have a non-Lutheran like Douglas Moo write the “Modified Lutheran” view in the Five Views of Law and Gospel book (an essay which I argued elsewhere is not the Lutheran view at all and should not be called even “modified” Lutheran). Anyway, I was reading through another book in the series, Understanding Four Views on Baptism, and came upon the response to the Lutheran view written by the Reformed believer, Richard Pratt, Jr. He wrote, “Broadly speaking, Lutheranism has stressed discontinuity between the OT and NT under the rubrics of law and gospel” (Pratt, 117, cited below). He contrasted this with the Reformed understanding of the unity of Scriptures. Douglas Moo also made a similar statement in the Five Views of Law and Gospel book: “Basic… to biblical revelation is the contrast between ‘before’ and ‘after’ Christ, a contrast between two ‘ages’ or ‘eras’… the New Testament writers… relegate [the Mosaic Law] basically to the period of time before the coming of Christ” (322). Moo’s view is allegedly the “Modified Lutheran View” in this book. What is astonishing to me about these statements, particularly the critical one made by Pratt, is that it seems to me neither of them has interacted with Lutheranism in a meaningful fashion. You see, Lutheranism has a very simple way to see what it does or does not teach: The Book of Concord . These contain the Lutheran Confessions which, from the earliest period of Lutheranism, are the means by which one may distinguish between teaching which is Lutheran or which is not Lutheran. Surely, anyone who seeks to critique the Lutheran view (Pratt) or “modify” it (Moo) should first go to see what Lutherans believe! These, and many other citations, make it clear that the entirety of Scripture contains both Law and Gospel. Moreover, the entire Article V of the Formula of Concord teaches that these two doctrines are found both in the Old and New Testament. In fact, the confessors noted that Jesus’ ministry demonstrated both aspects. Because Jesus’ ministry is in the New Testament, and yet Jesus utilized the law, it is clear that the Lutheran view is not a discontinuity between the Old and New Testament. For Pratt, this means that his allegation that his Reformed position preserves unity of Scripture as opposed to the Lutheran view which divides it is far off the mark. Lutherans hold that both law and gospel are found throughout the Bible, and the discontinuity is resolved by properly distinguishing these teachings. For Moo, this basically means his “modified Lutheran” view simply isn’t Lutheran. Long story short: the Lutheran view of Law and Gospel is not a temporal dividing line between the Old and New Testament. The Law Always Condemns, The Gospel Always Saves. Or, why I’m a Lutheran.– I outline the Lutheran view of Law and Gospel with references. If you’re interest at all in this discussion, I recommend you read this post to be sure you’re not messing up the distinctions Lutherans make. Douglas Moo, “The Law of Christ as the Fulfillment of the Law of Moses” in Five Views on Law and Gospel, ed. Stanley Gundry (Grand Rapids: MI: Zondervan 1999). Richard Pratt, Jr. “A Reformed Response” in Understanding Four Views on Baptism edited by Paul Engle and John Armstrong (Grand Rapids, MI: Zondervan, 2007). The Book of Concord edited by Kolb et al. (Minneapolis: Fortress, 2000). « Sunday Quote!- What does “head” mean? 83. But even *the Decalogue itself* and all that can be taught and prescribed inwardly and outwardly *is not good law* either. Not only does this indicate a temporal distinction, but the category of law is what is positively spoken of (“the good law” because it comes in the new covenant and is not of the Decalogue. I think this shows what I have long felt: That there is some tension in the Lutheran perspective on Law and Gospel. 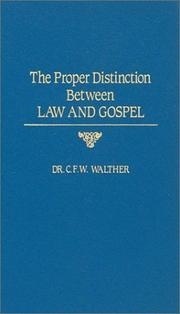 As it stands (according to Walther’s exposition, for example), the Lutheran perspective clearly delineates how the Law is to be used in the Christian life; what it does not do, nor even apparently attempt to do, is define exactly what is meant by “the Law.” Is it every law discussed in all of the Bible? The answer seems to be a clear “no,” but then the question is: how do Lutherans then look at individual/particular laws throughout the Bible and determine which are meant by “Law” in “Law and Gospel”? It’s an interesting question, and one that I am still trying to explore the answer to. So far as I know, there has been little work by Lutheran scholars in this area. If you are aware of any that attempt to combine the Lutheran view of Law and Gospel with a way of assessing particular laws, let me know. It is indeed an interesting question! No I’m not aware of any such attempt but it’s something I’ll think about more. Thanks for interacting! My knowledge of Lutheran doctrine, if I understand your question correctly, is that the Lutheran view of Law would include every passage of Law in the Bible. I’m not sure if your question is implying a deeper or more specific question. A great person to interact with on this question is Pastor Jordan Cooper, a Lutheran pastor who came out of the reformed tradition. He is intensely scholarly, yet very congenial and articulate in answering theological questions at a lay-level, and in engaging in theological discussions with his peers. Like you, he is strives to represent the viewpoint of others accurately. Pastor Cooper blogs here: http://www.patheos.com/blogs/justandsinner/ and his youtube videos are here: https://www.youtube.com/results?search_query=just+and+sinner. As a Lutheran Christian, I would love to hear Pastor Cooper address your question in a youtube video, if you would be interested in posing it to him. I know he is constantly inviting questions through his videos, and enjoys interacting with theologians of every stripe. I very much appreciate your article. So often we Christians debate our differences by falsely stating the position of the other. It’s so refreshing to see someone refuse to misrepresent the beliefs of another, so thank you very much for your thoughtful correction, and the respectful dialogue here.